On January 23 at approximately 10:00 p.m., British rowing foursome, Team Tyne Innovation from the North East of England, successfully finished the 3,000 mile Talisker Whiskey Atlantic Challenge, achieving a new world record as the fastest mixed four. Rowing the Atlantic Ocean from La Gomera in the Canary Islands to Antigua — Team Tyne Innovation came in 8th in the race with a time of 42 days, 10 hours and 26 minutes; overtaking the previous record by 14 days. Team Tyne finishes the race. The squad set off in December from the Canary Islands, spending more than six weeks at sea and set off flares as they finished more than a month later in Caribbean Island of Antigua. Rowing in shifts of two-hours-on, two-hours-off, 24 hours a day, over birthdays, Christmas and New Year, Team Tyne Innovation faced monstrous waves, strong, wind speeds, followed by searing heat and humidity, and even the calm waters at times made for frustratingly slow progress. 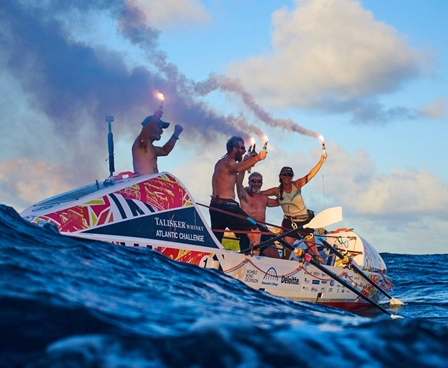 They even overcame fatigue and sickness caused by dehydrated food sachets to become world record holders as the fastest mixed four to cross the Atlantic. Through the battles they have faced, the team has shown that communication back home was more important than ever for the crew’s well-being and happiness. Using the Iridium GO! 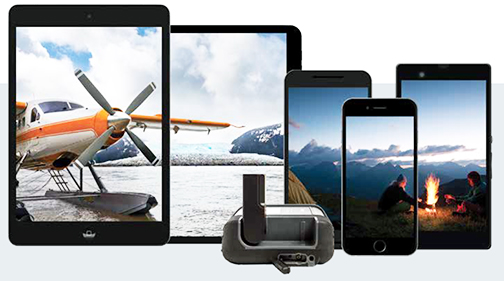 from Satcom Global, Phil, Allan, Steve and Claire, were able to connect to WiFi through their smartphones and make phone calls and send SMS to loved ones. The team sent photos and updates back to their shoreside team member James for their Facebook page and Twitter and were able to speak directly to the race safety team, as well as family and friends frequently. Through the use of maritime satellite communications, even in the middle of the Atlantic, they kept followers up to date with their impressive progress, interesting encounters and memories that will last a lifetime. In one instance with less than 1000 miles left, the team sent across pictures from their New Year’s dip in the sea that included photos of a flying fish which hit Phil in the face. Their challenge has been raising funds to support incredible charities including Daft as a Brush cancer patient care, the Stroke Association and St. Oswald’s Hospice.